It should be pointed out that, in "borrowing" the body of the medium, in any way, the communicating spirit does not actually get inside the physical body of the medium, but rather envelopes the body energetically. 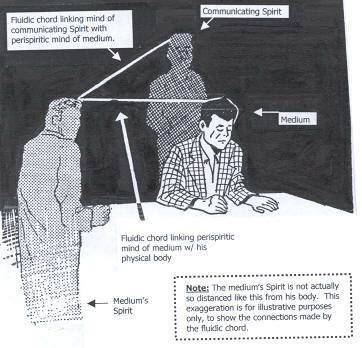 In addition to the spirit's energetic envelopment of the medium's body, there is also the fluidic/energetic interaction between the perispirits of the medium and the communicating spirit, which includes a fluidic cord that links the mind of the manifesting spirit with the perispiritual mind of the medium and the latter with the physical body of the medium (see picture at right), carrying the thoughts and impulses of the manifesting spirit to the material body. The conscious medium will, therefore, consciously perceive the thoughts of the communicating spirit before they reach his or her physical brain. The speaking medium perceives the words and gestures that the sprit intends to use. The writing medium knows the words that will flow from his hand before they are formed on paper. In the case of the unconscious medium, the thought waves of the communicating spirit work in the deepest zones of the medium's psyche, without reaching the conscious zone, whereby the medium does not consciously register the communication that takes place and does not remember anything after the communication. Depending on the medium's degree of mediumistic evolution, level of sensitivity and depth of trance, he or she can, in addition to relaying the spirit's message, feel the sensations transmitted by such a spirit, such as the pains, anguishes, fears, etc. of suffering and unenlightened spirits, and the sense of calm and happiness of more elevated spirits. Because these sensations are transmitted and perceived through a fluidic influence (of energy), it is quite common for other mediums at the session pick up on these vibrations as well. In the case of the suffering spirits, mediums in development are often reminded to be humble and compassionate, for if they are perceiving any discomfort, whatever sensation they are experiencing is only a fraction of what the communicating spirit is actually feeling. Peralva, Martins. "Incorporacao". Estudando A Mediunidade [Studying Mediumship]. Rio de Janeiro-RJ, Brazil: Federação Espírita Brasileira [Brazilian Spiritist Federation]. 1998 (20th ed). 51-56. Rigonatti, Eliseu. "Mediuns Falantes" [Speaking Mediums] A Mediunidade Sem Lagrimas [Mediumship Without Tears]. Sao Paulo: Editora Pensamento Ltda. 2000. 14-15. Rigonatti, Eliseu. "Mediuns Escreventes" [Writing Mediums] A Mediunidade Sem Lagrimas [Mediumship Without Tears]. Sao Paulo: Editora Pensamento Ltda. 2000. 16. Kardec, Allan. "Mediums"; "Writing Mediums or Psychographs": and "Identity of Spirits." The Mediums' Book. 2nd ed (1st edition FEB). Trans. Anna Blackwell (translated 1876). Ed. Livraria Espírita Allan Kardec. Brasilia-DF, Brazil: Federação Espírita Brasileira [Brazilian Spiritist Federation}. 1986. 179; 189-190; 191; and 196-318. Luiz, André (Spirit Author) / Xavier, Francisco Cândido (Medium). "Psicofonia Consciente" [Conscious Psychophony]. Nos Dominios Da Mediunidade [In The Domains of Mediumship]. Rio de Janeiro-RJ, Brazil: Federação Espírita Brasileira [Brazilian Spiritist Federation]. 1945. 48. Luiz, André (Spirit Author) / Xavier, Francisco Cândido (Medium). "Psicofonia Sonambulica" [Somnambulic Psychophony]. Nos Dominios Da Mediunidade [In The Domains of Mediumship]. Rio de Janeiro-RJ, Brazil: Federação Espírita Brasileira [Brazilian Spiritist Federation]. 1945. 63. Projeto Manoel Philomeno de Miranda (José Ferraz, Nilo Calasans, João Neves, e Geraldo Azevedo). "Beneficios" [Benefits] and "Doutrinaçã" [Counseling]. Qualidade Na Prática Mediunica [Quality in the Practice of Mediumship]. Salvador-BA, Brazil. Livraria Espírita Alvorada. 2000. 69-70 and 113 (respectively). Fernandes, Odilon (Spirit Author) / Baccelli, Carlos (Medium). "Psychography." We Are All Mediums. Trans.Coelho, Públio Lêntulus Vicente. Votuporanga- SP, Brazil. Casa Editora Espírita "Pierre-Paul Didier". 2001 33-34.